New Delhi, March 22 (IANS) Finance Minister Arun Jaitly on Friday attacked Congress President Rahul Gandhi over his chief advisor Sam Pitroda’s remarks on the Pulwama attack and said if the ‘guru’ (teacher) has such thinking, then one can imagine how his student would be. He said the fight against terror cannot be won by playing on the backfoot and India’s security doctrine had evolved to a point where it does not just defend itself, but can also go to the origin of terror and make a pre-emptive strike. 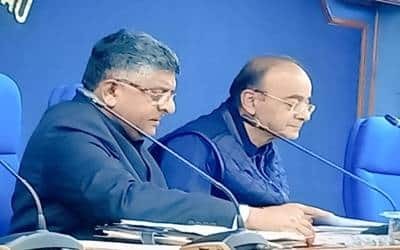 Jaitley’s remarks came in response to Pitroda’s comments that incidents like the February 14 Pulwama suicide bombing "happen all the time" and that the UPA government also could have sent planes to Pakistan after the 2008 Mumbai terror attack but "that is not the right approach". "It is unfortunate for India that somebody who is an ideologue of the Congress has said so. I think such people have no connect with India’s security requirement, the sentiment of India and Indian forces, and the pain and loss that we have suffered in last three decades due to terrorism," he said.